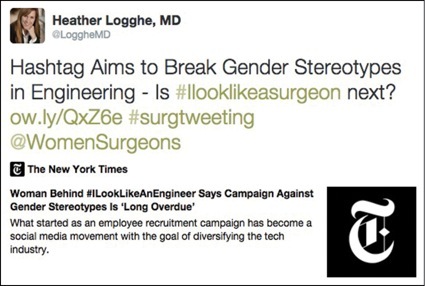 In August 2015, Heather Logghe, MD, then a preliminary surgical resident at the University of North Carolina at Chapel Hill (UNC), saw a tweet with the #ILookLikeAnEngineer hashtag—part of a Twitter campaign launched by female engineers to challenge the stereotype that their profession was only for white men. That night, Dr. Logghe sent out a tweet with a link to the #ILookLikeAnEngineer campaign and asked “Is #ILookLikeASurgeon next?” Within a few minutes, a female surgeon in Northern Ireland tweeted her photo, along with the hashtag. A minute later, another tweet came from a female surgeon in Chicago—this one wearing a colorful scrub cap and revealing a pierced tongue. Two nights later, inspired by a handful of tweets and messages from surgeons around the world, Dr. Logghe wrote a blog post titled “#ILookLikeASurgeon. Tweet It. Own It: Be the Role Model You Always Wanted but Never Had.” She went to bed and by the time she woke up, the hashtag had taken hold. According to a report in the American College of Surgeons bulletin, by October, #ILookLikeASurgeon generated more than 128 million views, nearly 40,000 individual tweets and more than 7,900 participants. The tweet that started it all. Heather Logghe, MD, inspired by female engineers, started the #ILookLikeASurgeon hashtag in August 2015, to challenge traditional stereotypes in surgery. Dr. Logghe, who is currently taking time away from clinical responsibilities to have a second child, spoke with General Surgery News about the unexpected success of the #ILookLikeASurgeon campaign and how it is breaking down stereotypes in surgery. Q. #ILookLikeAnEngineer was an incredibly effective campaign. When you sent out your first tweet with the #ILookLikeASurgeon hashtag, did you expect that it would take off? A. I never dreamed the movement would have this magnitude and momentum. In August, I had just completed a second preliminary year at UNC and was initially uncomfortable posting a photo. In fact, I deleted my first tweet with the photo and then put it back up with “#ILookLikeASurgeon (In Training).” As residents, we often question at what point we are justified to refer to ourselves as a “surgeon.” But the way it’s worded, there’s no reason anyone aspiring to be a surgeon should be uncomfortable using the hashtag. I’ve since encouraged premed students aiming for a career in surgery to tweet their photos. After the initial tweet, I got responses from surgeons in Northern Ireland and Chicago. With the encouragement of surgeon blogger Kathryn Hughes, MD, (Twitter account: @DrKathyHughes), I decided to put together a blog post to explain the idea. I worked all night on it. I went to sleep for a few hours, woke up and Columbia Surgery had tweeted a response. And then, it just took off. Q. Have you ever been told that you don’t look like a surgeon? A. Yes. It’s subtle. Patients often assume that I’m a nurse. While I consider this a compliment, it confuses the patient–physician relationship. Beyond the physical stereotypes, women often are told they seem “too nice” to be surgeons. It’s notable how many female surgeon bloggers have blogged about “being nice.” That’s where the stereotype hurts men as well. It’s not just about gender and race; it’s also about this cold, technically gifted but emotionally distant persona perpetuated by media and cultural expectations. Q. Why is this phrase #ILookLikeASurgeon so effective? Q. This seems to be about more than challenging a male stereotype within surgery. Is that correct? A. For sure. It’s been embraced by all genders. I said to Chris Porter, MD (@PorteronSurg, a general surgeon and prolific tweeter who set up OnSurg.com, a social media community for surgeons), “you haven’t tweeted” even though he’s been a high-profile Twitter person for some time. He said he wasn’t sure he was welcome to do so. At first glance, he’s the stereotypical, middle-aged, white man. He said he didn’t want to take the limelight. I told him that this hashtag is for everyone. He tweeted a photo of himself and his 8-year-old daughter with glitter on their faces. He followed up with a very powerful blog post about how the stereotype of a surgeon doesn’t fit the single-male parent. The outdated expectation that every surgeon has a stay-at-home partner, taking care of the family no longer fits today’s reality. Celebrating diversity and promoting an inclusive environment have been important elements of the movement from the beginning.